iPhone owners that aren’t ready to shell out the cash for a Kindle ebook reader don’t have to now that Amazon has released a Kindle client application for the iPhone and iPod touch. 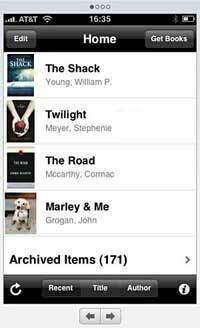 The app lets users keep all of their Kindle content in sync across multiple devices, and iPhone and iPod touch users can purchase Kindle content through a special Web-based interface. Kindle for iPhone and iPod touch also supports Kindle bookmarks, notes and annotations, along with text size control. The application is free and is available for download at Apple’s iTunes-based App Store. I’ve been waiting for this development. I decided a while ago that I wasn’t going to invest in yet another gadget to carry around in my purse. I tried that with a Treo PDA years ago and it’s just as much hassle to grab a paperback on my way out the door. The thought of having a whole bunch of books to choose from in an e-format is intriguing, so I’ve been waiting for an e-reader app for the iPhone/iPod Touch. Eventually I want to get an iPhone to replace my current mobile phone, but for now I’ll borrow the hubby’s iPod Touch.